Lifestyle Blogger – talking about beauty, fashion, travel, fitness. ….everything that makes a beautiful YOU! Manicure Monday – Neon French! Thats my manicure monday in neon:) Honestly, i am not a very big fan of Neon colors, but its the color of the season right now and everywhere you go…everything is brightly lit with neon colors…be it nail polishes, shoes, bags, tees….everything is just neon! I couldn’t resist and picked up a neon nail polish myself and tried this nail art over the weekend. 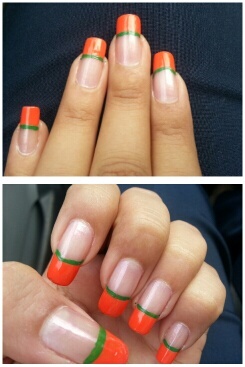 Its a easy one…did french manicure in neon orange and put a line across in green. That way, it doesnt look very blingy 😉 I loved the output…was so skeptical of wearing neon shade in the beginning but i think using it as french does a wonderful job at giving it a subtle look. Do pick up some neons this season and give it a try…for all you know…you may love it too like i did:) Do share your nail art. Have a wonderful start to the week. Shasha on Patanjali Products Review!